Wires are so last century. For many, wireless mice have become the standard for computer interaction. If you’re going to have an input device that is designed to be constantly moved around, why would you want anything getting in the way? At this point, there are thousands of choices vying for your wireless dollar, ranging from under $20 to well over $100. Many are specifically tailored to certain niches — like the best gaming mice. But which are the best wireless mice overall? While that’s certainly a subjective question, you can’t go wrong with any of the picks below. Building on the sterling legacy of its predecessor, the MX Master 2S is a sublime wireless mouse that offers great accuracy, comfort, and features. With a sensitivity that can be adjusted in 50 dots-per-inch (DPI) increments, from 200 all the way up to 4,000, it has support for fans of all sensitivities and use styles. Its 500 mAh rechargeable battery can last up to 70 days, so you won’t need to worry about running out of juice anytime soon, and it features fast recharging too. For those facing long days of mouse use ahead of them, Logitech has paid particular attention to the ergonomics of this device. There’s a reason it’s one of the top mice on our list of the best ergonomic mice too. It features great thumb and finger rests, with a shape that caters to different grip types and helps prevent repetitive strain injury and carpal tunnel. One of the best features though, is multi-device support. If you want to jump from laptop to desktop and back again, you can do it swiftly and easily with the MX Master 2S, as it can pair with up to three devices at once and switch between them at the touch of a button. With support for both Logitech’s unifying receiver and Bluetooth technology, you don’t even need to switch the wireless receiver over either. Although targeted toward Surface device owners who want a little more functionality than the standard touchpad offers, the Microsoft Surface Mouse is an equally capable wireless mouse on any other system you choose. It’s elegant, streamlined, ergonomic, and most importantly, lasts for as long as a year on a pair of AAA batteries. Its switches and scroll wheel are rated for thousands of hours of use and an enormous number of actions. This mouse also ships out with a one-year warranty, so you’re covered if you face any short-term problems. Logitech has a lot more competition in the gaming peripheral space than some of its other markets, but that doesn’t mean it’s not at the top of its game in this space. Its G Pro Hero is one of our favorite gaming rodents with good reason. It has a 1ms latency for its wireless connection, a 16,000 DPI optical sensor, and can track at up to 400-inches per second for high-speed gaming. But even with all of that technology under the hood, it weighs in at less than three ounces, making it comfortable to use for all hand sizes, but not so lightweight that it’s easy to lose control of. Its ergonomic shape makes it supremely comfortable in our long gaming tests, and thanks to tweaks to its overall shape, there’s an accumulation of dirt and grime over time. If you don’t like anything about the button mapping the mouse ships with, it has full support for Logitech’s programmable software, so you can remap any of the G Pro’s eight buttons to execute the exact commands you want. You can also tweak the polling rate and the RGB lighting of the G-Pro logo, then save it all to the mouse’s onboard memory for use on different systems. If you’re looking for a wireless mouse so you’re not stuck using your laptop’s touchpad, this is the tail-free mechanical rodent for you. It sports a small profile so it’s easy to carry, but large enough so you don’t feel like you’re pushing a child’s toy. Its compact form is sculpted to fit your hand and provides enough space on the left side to provide two additional buttons for your thumb’s pressing pleasure. Given this mouse is built for mobile, you won’t find an arsenal of buttons. Outside the mentioned thumb buttons, the mouse only features the standard left/right click buttons, and a middle clicker mounted behind the mouse wheel. This wheel can tilt left to right for horizontal scrolling, and provides two tactile-based modes. It has Click-to-Click for bump-based tactile feedback, and Free-Spin for a smooth spin. With Logitech’s MX Anywhere 2, you can connect to your PC in three ways — via the provided USB cable, Bluetooth, or by using the included Logitech Unifying Receiver (2.4GHz wireless). It supports the Logitech Easy Switch platform, meaning you can pair up to three compatible mice, and switch between them with a simple press of a button located on the bottom of the peripheral. 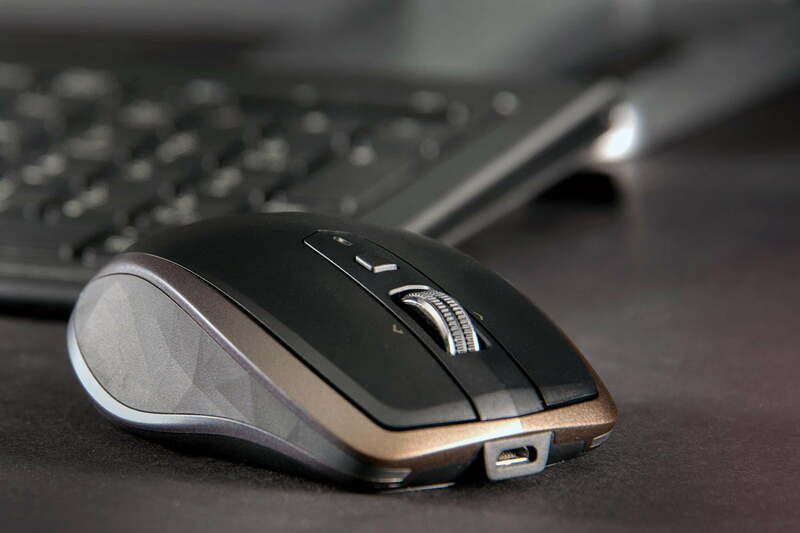 If ergonomics is your primary focus, the Evoluent VerticalMouse is our pick. We ran this bad boy through the gauntlet in 2016, and it’s still one of our favorite mice on the market. Overall, the VerticalMouse looks like a dorsal fin protruding from your desk. The unit tapers toward the flared base, keeping your hand elevated and allowing you to more aptly keep your wrist aligned with your forearm. This positioning relieves physiological stress, potentially minimizing fatigue and the risk of developing carpal tunnel syndrome. The unit is divided into three main elements. With the right-handed model, the button and wheel are located on the right side of the device. The left side incorporates a rounded indentation for your thumb to rest along. This setup allows you to grip the mouse at a 90-degree abduction angle when compared to a standard mouse. The Microsoft Wireless Mobile Mouse 1850 is an economical, no-frills wireless mouse. It may not blow you away with adjustable click force or customizable accents, but if you’re in need of a wireless mouse and want to spend less than $20, this is your best bet. The symmetrical, ambidextrous design makes the Mobile Mouse 1850 perfect for users of left- or right-handed persuasion, and its compact design makes it great for those on the go who need a portable wireless mouse. Its nano-transceiver is similarly diminutive making it easy to stow away — just make sure you don’t lose it! This Microsoft mouse can last up to six months on a single charge too, which is a welcome feature, to say the least. It also comes with a three-year warranty, so if you run into any problems in the near or medium term, you’re well covered.